Hairdressing Saloon & Chinese Supermarket to loan Ghana $300m? Details emerging from the government's new proposed loan agreement suggest that it might be heading for an embarrassment as more question marks hang over the true status of the lending company. The Chinese New Techniques (CNT) Construction and Investments Limited, which is to provide Ghana with a US$300 million loan has been described as a mysterious entity. The proposed loan agreement has been shrouded in controversy ever since the NDC kicked against it saying the terms were too good to be true. Some financial analysts have also cautioned government about such deals, which look so attractive. Deputy Finance Minister Dr. Anthony Akoto Osei says the ministry is now reviewing the loan agreement in the light of the controversy and the issues that have come up. Some observers say a decision to back out of this agreement will be embarrassing for government especially following the controversy that greeted a similar loan proposal by another mysterious organisation known as the International Financial Consortium, which bore uncanny resemblance with the World Bank affiliated International Finance Corporation. What initially sounded like the tantrums of a spoilt child is gradually turning out into a big issue that many observers say can embarrass the Kufuor administration. The NDC's concerns, which emerged only after parliament including the NDC members had approved the loan agreement, have led to the unraveling of very disturbing details. In a case akin to the famous botched IFC loan agreement it has emerged that the lending company, CNT has no registered office and operates from a hairdressing salon. Independent enquiries confirmed by JoyFM contacts in the UK have revealed that the office address provided by the Chinese New Techniques Construction and Investments Limited belongs to a hairdressing salon - Wish hairdressers and Adrenalin Arts & Entertainment. Even the postcode provided for the 150 Hammersmith Road has been found to belong to a London address. (238A Latymer Road, London.) How these little details that could be easily checked escaped the finance ministry officials, no one knows. But JoyFM has information that the schedule officers at the finance ministry did warn the political authorities against proceeding with the deal, after satisfying themselves that the lenders are not being exactly straight in their dealings. For example JoyFM has established that the Hong Kong based parent company- CNT Group Holdings has a total capitalization of about 50 million dollars only and are involved in the manufacture of granites and paint products. Investment analysts contacted in New York agreed with the NDC's concern about the 0.65% interest rate and the huge management and processing fee. A member of the NDC's economic team Ato Ahwoi who has considerable experience in loan & contact negotiations told JoyNEWS the CNT loan smells very much like the IFC loan scam that embarrassed government. In all these, government has described the concerns raised as politically motivated, relying heavily on the NDC MP's support for the loan agreement in parliament. 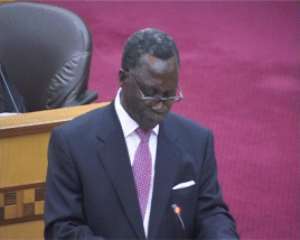 Deputy Finance Minister Agyeman Manu told JoyNEWS last week that the issues raised by the NDC are insignificant. Deputy fiancé minister Dr. Akoto Osei sang a different tune however this morning. He told JoyFM that the minister of Finance is yet to sign the agreement, adding that the concerns being raised now will have to be looked at.